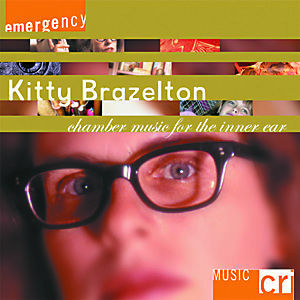 2002 splendidezine review of "Chamber Music for the Inner Ear"
Soundclip: "Called Out Ol' Texas"
Kitty Brazelton is a record clerk's nightmare. I mean, where to put her? Picture a poor, goateed soul wandering through the bins with Chamber Music for the Inner Ear. He stops distractedly at contemporary classical (after all it's chamber music, right? ), moves briefly to free jazz (well, I did hear some muted Miles-style trumpet), pauses at Latin ("Sonar Como Una Tromba Larga)", and ponders new age (that "R" song sure has some spooky vocals) before tossing it on the counter and going out back to smoke a joint. Really, the only solution is to put the disc on the in-store stereo and leave it there until somebody buys it. I'd give it three or four tracks; Chamber Music for the Inner Ear may be unclassifiable, but it's also instantly engrossing. It starts off with the brass-toned splendor of "Come Spring! ", a four-movement suite performed by the Manhattan Brass Quintet. Understand right now that this is not about a hearts and flowers image of spring. Rather, it's a tribute to the unstoppable life force that potholes roads and breaks boulders, the sap that comes from deep in the ground and sets all hell loose round about April. Movement one, "Dogwood petals and hormones", begins with slow brass chords that twist into shattering discord. A skittering trumpet flutters against walking quarter notes of the lower sounds. Dulcet trombone picks out the bright tones, as a tuba buzzes like the million insects creeping from the ground. There's a rich, sexual energy to all these chords that builds throughout the piece. The second movement, "Miles Through the Upstairs Window", steps back a bit, leading off with single querying notes -- French horn, I think -- separated by silence. The notes come closer together, merging in a quick pattern. The trumpet flirts with the tuba, pulling back where the deeper sounds flourish in a syncopated rhythm. The third movement, "Harmonic Fable", has a swingier feel to it, with a bouncy trumpet line over a Gregorian hymn. The piece ends with "First Second Seder at the Knitting Factory", a tribute to the Manhattan club's "Second Seder" feasts, which brought musicians from a variety of disciplines together in jazz improvisation. At this point, you'll be saying, "I've got it. It's modern, jazz-tinged classical with a heavy reliance on brass." Perhaps...but what will you make of "R", a swooning piece that blends unearthly wordless vocals, vaguely Middle Eastern rhythms and mesmerizing violins? It's followed by "Sonar Como Una Tromba Larga", featuring Chris Washburne on trombone. The track opens with a high hanging tone, which, the liner notes say, is an electronically manipulated sample of Washburne's breath. Slow, perfect trombone notes blend with this echoing backdrop in an eerie duet of Washburne and Washburne. Midway through the piece a rhythmic cadence begins, incorporating metallic clinks and rattles. Against this Latin slink, the trombone slides like a heavy sensual arm around the quick, dancing percussion. The interplay of mind and body -- of thoughtful abstraction and sexual pulse -- runs all through Chamber Music. You can hear it very clearly on "Called Out Ol' Texas"; the title is an anagram for "alto sax cello duet", exactly what this piece is, and although it's not a common pairing, the two sounds work well together. The alto sax lends modern angst to the sweet murmurs of the cello, and then, as the cello turns to anxious quick bowing, the sax picks up the high line of melody. The piece is never entirely without conventional beauty -- nor without the rougher sounds that comment upon it.